This past weekend I had the incredible honor to be part of Hope Scarves Outrunning Cancer team. 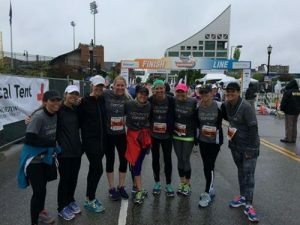 Our team of 165 runners raised over $50,000 to support women facing cancer and metastatic breast cancer research. AMAZING! My heart is overflowing with gratitude as I think back on this once in a lifetime weekend. I would give cancer back in a heartbeat, but since I can’t, I can say the one beautiful thing that comes from the darkness is the love and support people share. I am humbled and so honored for the outpouring of love and laughter this weekend brought to the world. I can’t begin to capture all of it, but here are some of the best stories from the weekend. We kicked off race weekend with a Pre-Race Pasta dinner for over 200 people. The space was buzzing with race day excitement. As the kids ran around with balloon swords and runners chatted I had the honor to meet a young woman running in honor of her mother who was a Hope Scarves scarf recipient. I had met her last year and reconnecting as she beamed with pride for her daughter was so touching. 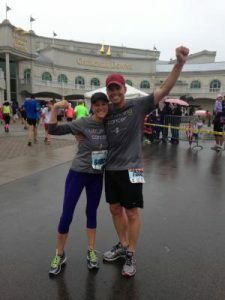 Three husbands were running in honor of their wives in treatment. All raising over $1000 for Hope Scarves and Dan coming in as our second highest fundraiser with over $6,000! One of them, my own. Who not only rounded up three teams of runners at his business but also ran by my side throughout the race. The love in these men’s eyes as they shared why they ran was priceless. My family traveled from multiple states to be here this weekend. As I shared my heartfelt remarks about what the race means to me I was so happy to look out and see my parents, brother, in-laws, uncles, aunts and grandma in the front row. It means so much to be able to show them what we have created at Hope Scarves. Race Day! The weather was rainy and cold. But it didn’t dampen our spirits!! 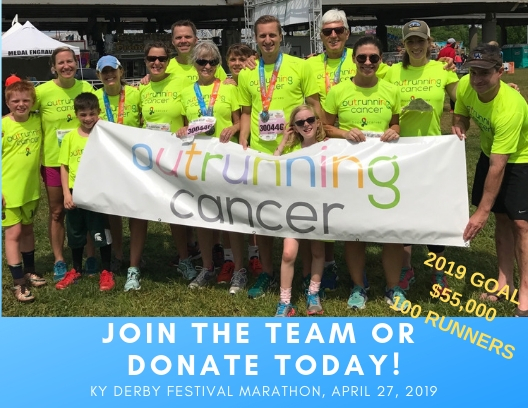 Our runners were sporting their awesome Outrunning Cancer Shirts with pride. As I walked up to the start of the 13.1 mile race a young woman approached me and asked if we were “Hope Scarves.” She told us her friend in New Mexico recently received a scarf and had told her to look for us. She laughed that she had no idea what she was looking for amongst the 15,000 runners … people wearing scarves?? But we ran right into each other and I gave her a big hug and took a picture together. It meant so much to me to have this encouragement from a scarf recipient hundreds of miles away before I embarked on my 13.1 mile run. I turned around and my sister in law, best friend and husband were all in tears behind me. My sister in law laughed through her tears saying… “this must happen to you all the time. But, that was just awesome.” “This is so much bigger than me” I said. I felt great for the entire 13.1 mile run! Handing off to my dad at mile 6, taking pictures along the way, high fiving fans, cheers for Outrunning Cancer the whole way! At mile 12 I slowed down a little as the rain pelted down. Laura and Jay encouraged me that I could do it. I looked up at them with tears and rain streaming down my face and told them I wasn’t slowing down from being tired. I simply didn’t want the moment to end. I wanted to stay in that moment of accomplishment, strength, health, gratitude forever. Even as the blisters throbbed on my feet. I was SO HAPPY!! 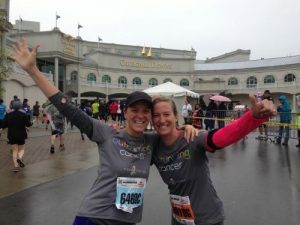 We crossed the 1/2 marathon finish line hand in hand and hugged in the pouring rain as hundreds of runners filed in behind us. 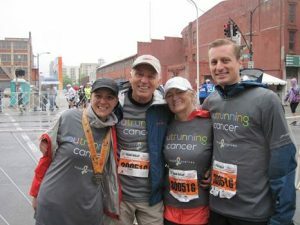 In a sea of accomplishment, for that moment, I had Outrun cancer. We welcomed runners all afternoon at our Hope scarves tent, keeping warm with the love and enthusiasm for what we were accomplishing that day (and a little Kentucky bourbon…) I ran the last 1/2 mile and crossed the finish line twice more that afternoon – once with my family and dear friend Anne as part of our family relay. Then again with my 10 Hope College friends who raised over $12,000 for Hope Scarves as the top fundraiser for 2015. We spent the afternoon celebrating with a post race/ Derby cookout at our home for 44 dear family and friends and then headed to Gerstels Place for the Post/post race party. Friends of Hope Scarves hosted a Post Race party honoring one of our scarf recipients, Allison Bayer. And we turned Outrunning Cancer into Outdancing Cancer as we celebrated together until 1:30am! I never wanted the laughter, joy and celebration to end! When you live with Metastatic Breast Cancer you treasure your good days. Living with uncertainty of the future makes the “right now” so much more meaningful. I often joke as people tell me to slow down that I am squeezing every bit of my joyful, intense life into a shorter timeframe. I have a lot of living to do and I don’t know how much time I have to do it – so I am doing it with purpose and enthusiasm while the living is good! Just a super bonus if I get to live like this for years and years! Thank you to everyone who donated, ran, cheered, painted centerpieces, believed in us and encouraged us along the way. I can confidently say that on Saturday I OUTRAN CANCER. WE OUTRAN CANCER!! At this time last year I never could have dreamed that I would get this past weekend. 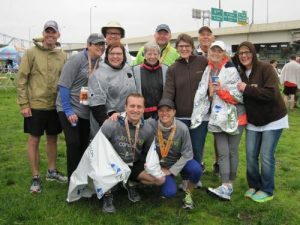 That I would have felt so strong running 13.1 miles and that the community of supporters would give so generously to our mission. We have miles to go… but we are a little closer after the steps we took together this weekend. If you still wish to support Hope Scarves and the Outrunning Cancer team please click here. Cancer is the fool today! Happy to share that my PET scan showed no evidence of active disease. My best friend NED is sticking around! Thank you for keeping me in your heart today. I feel surrounded by your prayers and encouragement and it brings me great comfort. Jay and I enjoyed a beautiful day with brunch at our favorite cafe, a trail run and a stop at the plant kingdom to start our vegetable garden. I look forward to a glass of bubbly on our deck tonight as we soak up the sunshine and good news. We recognize that cancer can rear it’s ugly head again at any time. But today… Today we exhale and celebrate this good news! My sister, Chris, brought me the information when she came to stay with me for my first chemo treatment. Chris has endometrial cancer…need I say more. I received a scarf and was so touched by her story. I wore it all the time! After my hair started to grow back I wanted to show it off and sent back the scarf along with one of my own. I truly hope that the woman that receives it gets the same warmth that I got from my donor. Without question it was the support from my family and friends. It was overwhelming and will stay with me forever. I have Herceptin every three weeks until October. I take Arimidex for five years. My lastest reconstructive surgery was one month ago. I will most likely have one more in the near future. I try not to think about the “what ifs” or “did I do the right thing”. I can’t wait to get back to work!!. I wish people knew how such a simple thing like getting a scarf in the mail can make you feel. I received the scarf after my second treatment and was so sick. It truly brought me hope. 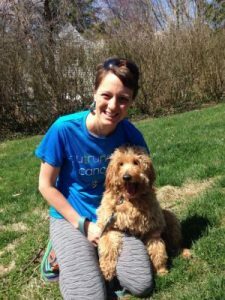 I want to volunteer to help people going through chemo. To talk to them, listen to them, hold their hand; tell them that I really do understand how they feel and that the terrible side effects will go away. 10. Please share something you have learned facing cancer. I lost my husband to cancer five years ago, my sister is now in her third battle. What I learned is that I never really knew how they felt. No one can truly understand how someone feels. Because of this, I have learned to listen.